Pushed up by high demand and limited supply, the median price hit $507,500, up 11 percent from a year ago. It has still not reached the housing boom peak of $517,500 in November 2005. Part of last month’s price jump was due to a substantial increase in the price of newly built homes and resale condos. The median price of a new home in the county was $765,000, a jump of 26 percent from the same time last year. There were 256 new home sales in October, up 20 percent from the same time last year. But resale homes, which made up 63 percent of October sales, also powered prices up. The median price for a resale house was $549,000, up 9.1 percent, its biggest year-over-year increase in 2016. Sales came in at 2,259, up 5.5 percent from a year ago. More than 1,000 resale condos sold, bringing the median to $385,000, up 10 percent in a year and its highest point since May 2007. Andrew LePage, data analyst at CoreLogic, noted home sales were still at historic lows, about 6 percent below average for October going back to 1988. He said the lack of homes for sale continues to put pressure on the market. “It comes down to job growth and limited supply,” he said. There were 3,597 total sales in October, down 5 percent from September, but up 7.2 percent from the year before. Unlike the last time when home prices rose this high, fewer homes are being built. In 2005,15,258 residential building permits were granted in the county. So far this year, 7,412 have been granted. Also, there simply aren’t as many homes for sale. In October, the Greater San Diego Association of Realtors recorded 6,211 active home listings, down by more than 2,000 from two years ago. The rise in price reflected a market still recovering from the Great Recession but does not yet indicate how rising mortgage interest rates will change prices. He predicted the median home price would eventually meet and exceed the previous peak, perhaps sooner than some might expect. “It will happen. It was just the last time it was so grossly subsidized by lending practices that it reached a height that it has taken more than a decade to match,” Kuhn said. Even with rising mortgage rates, he said prices will likely see a boost in the short term as potential buyers get off the fence to head off further increases. Median home prices across Southern California are up 6.9 percent year-over-year, but San Diego County is up the most at 11.1 percent. It was followed by San Bernardino County, which rose 9.6 percent to $285,000; Orange County with a 9 percent increase for a median of $655,000; Riverside County with an 8.1 percent increase for a median of $335,000; Los Angeles County with a 7.4 percent increase for a median of $525,000; and Ventura County with a 7 percent increase for $535,000. There’s some indication more San Diego County homes are being bought by people that intend to live in them. Twenty percent of sales in October were to absentee buyers, investors who usually don’t live in the homes themselves. In early 2013, 31.3 percent of sales were to absentee buyers. Cash buyers made up 18.7 percent of October sales, a far cry from the peak of 37 percent in February 2013. Distressed sales, made up of foreclosures and short sales, were down, making up 4.2 percent of sales. That’s down 2.6 percent from last year. The peak after the recession for short sales was 23.1 percent in January 2012. The foreclosure rate was 0.33 percent in August, improved from 2.99 percent in October 2009. The median home price is not the only way to track the health of the market. When looking at repeat sales of identical single-family houses, home prices also showed signs of growth. 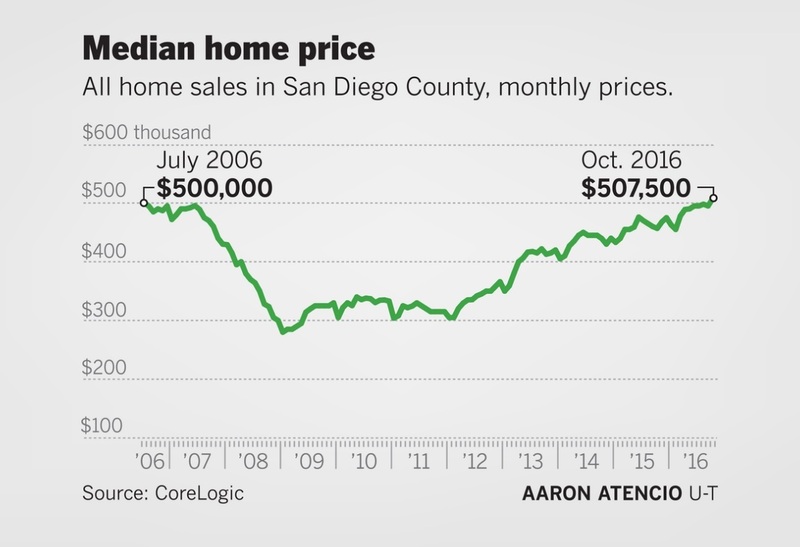 Adjusted for seasonal variation, the San Diego index of home prices was 5.3 percent higher in September compared to a year ago, said the S&P CoreLogic Case-Shiller Indices also released Tuesday. However, compared to August, the market appreciated by 0.27 percent, or at an annual rate of 3 percent, continuing a slowing down pattern that began in June. Most of the year’s price increases came at the start of the year, beginning with an annual growth rate of 12.9 percent in January. San Diego County was outpaced in home gains by the nationwide increase of 5.5 percent. The biggest gains were in Seattle (11 percent), Portland (10.9 percent), and Denver (8.7 percent). The lowest gains were in New York City (1.8 percent) and Washington, D.C. (2.7 percent).